There’s a new ritual in my sewing life. I make a date with my skirt block every time my favorite sewing teacher opens up registration for her Skirt Skills e-course. Sometimes I even re-take the course (alumni get a discount) to inject some organized sewing motivation around a new custom skirt project. Sharing with other students in the forum and the chance for one-on-one support from a couturier is almost irresistible every time. When Brooks Ann announced another course starts on September 5th, I got ready to sew-along by pulling out my skirt inspiration sketches (like this one), poster board skirt block (which gave birth to my bifurcated trouser block), and self-drafted denim pencil skirt pattern (with original construction samples) to help me plan and design a second denim skirt (the first one I made is the highlight of my wardrobe right now). This one will have plenty of features to warm me up for jeansmaking. Skirting the issue further, there’s Ebi’s purple animal print pencil skirt released into the wild just before her birthday (too damn cute). 1 out of the 18 sewing meet-up activities Kate shared on her blog includes draping and drafting a bodice using cling wrap! The difference between flounces and ruffles, as explained by The Cutting Class, has unruffled the subject in my mind. That time Eliza rotated the back darts of a pencil skirt to the side seams, I vowed to do the same one day. On her blog, Brooks Ann explains how she learned to sew without ever using commercial sewing patterns (its how I knew she was the right teacher for me). The 5-minute video interview with a Levi’s Master Tailor about making bespoke jeans that re-fueled my fire for the process. I shared a simple hack on Instagram for assembling a set of 1 lb. pattern weights with hardware store washers and plain white glue. Let me know if you try it! This entry was posted in News and tagged Brooks Ann Camper, jeans, newsletter, sewing blogger, sewing blogs, sewing class, skirt block, skirt skills. Bookmark the permalink. You know my favorite thing about this post is checking out your amazing denim pencil skirt again! Thanks for the shout out — I’m still in your pencil skirt shadow. 🙂 Going to check out the links….cling wrap you say? Hey, Ebi! Happy belated birthday. Our pencil skirts can hang in the sewing hall of fame together. And yes…that cling wrap bodice party had me #mindblown. Thank you for the mention. And now I know the difference between a ruffle and a flounce. You’re welcome, Kate. Always love what you share with us. Yay! Thank you so much for the shout outs Najah! The feeling of love for working together is mutual. 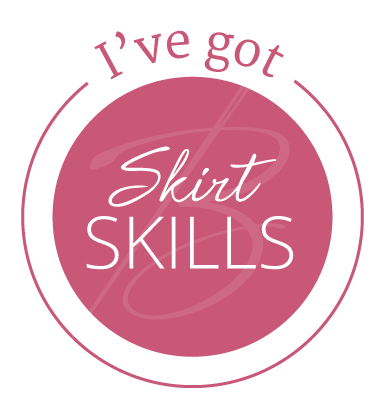 (I’ve got Starship’s “Nothing’s Gonna Stop Us Now” playing in my head…) I’ve just made a note to add the links to the flounces vs. ruffles and the cute little darts in the skirt side seams posts to the bonus links of the Skirt Skills patternmaking lessons. Thanks for sharing all these little gems! So glad you like the “gems”, Brooks Ann. Since the soundtrack in my head that keeps me going is a loop of Journey songs, Don’t Stop Believing that we’re unstoppable! Sew glad you like it, Marnie! I am having fun, too.